titled Royal Wulff) and damsels in distress. where I purchased my favorite hand thrown coffee mug - 30 years ago! The first novel in the clever and fast-paced Sean Stranahan Mystery Series. A Death in Eden, the seventh in the series, is now available. When a fishing guide reels in the body of a young man on the Madison, the Holy Grail of Montana trout rivers, Sheriff Martha Ettinger suspects foul play. It's not just the stick jammed into the man's eye that draws her attention; it's the Royal Wulff trout fly stuck in his bloated lower lip. Following her instincts, Ettinger soon finds herself crossing paths with Montana newcomer Sean Stranahan. Fly fisher, painter, and has-been private detective, Stranahan left a failed marriage and lackluster career to drive to Montana, where he lives in an art studio decorated with fly-tying feathers and mouse droppings. With more luck catching fish than clients, Stranahan is completely captivated when Southern siren Velvet Lafayette walks into his life, intent on hiring his services to find her missing brother. The clues lead Stranahan and Ettinger back to Montana's Big Business: fly fishing. Where there's money, there's bound to be crime. 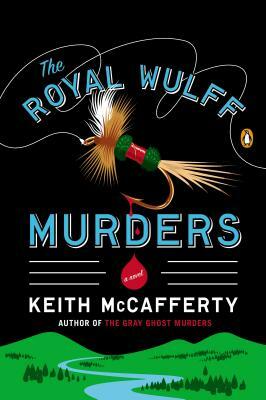 Keith McCafferty is the survival and outdoor skills editor of Field & Stream, and the author of The Gray Ghost Murders, Dead Man’s Fancy, Crazy Mountain Kiss, which won the 2016 Spur Award for Best Western Contemporary Novel, and Buffalo Jump Blues. Winner of the Traver Award for angling literature, he is a two-time National Magazine awards finalist. He lives with his wife in Bozeman, Montana.